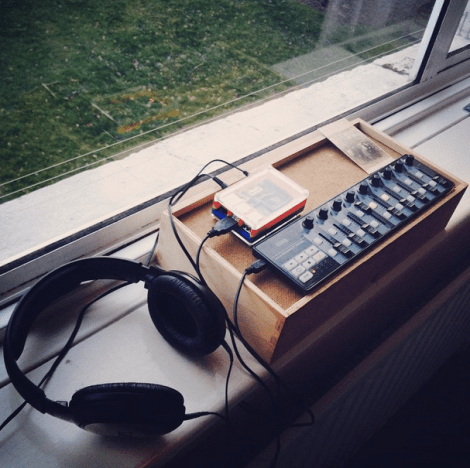 I’ve been pining for a headless, non sample-based computer setup for a while now, and it’s about time I played around with a Raspberry Pi, so I’ve been building a simple noise and sine tone generator instrument. 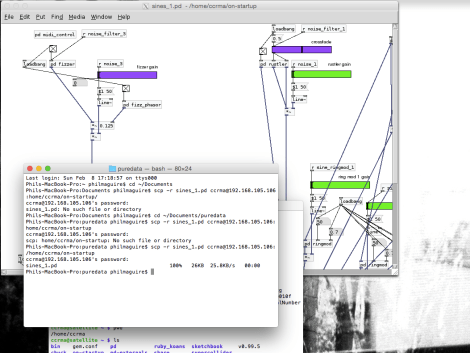 The sound generators have been built in Pure Data, and the patch is running on the Pi via Satellite CCRMA. Satellite is designed to run audio applications headless (i.e. without a screen/monitor). I get tired of having a screen obstructing, both as a performer and audience member. When I’m performing and end up staring at a screen, I stop listening to what’s happening. The Pi runs the noise/sine patch headless, and I control it simply with a Korg NanoKontrol. I’m super excited about it; no screen distracting me from the sounds. The patch contains four noise-makers; crackles, rumbles and rustles, and four sine tone oscillators; two high, two low. All of these run randomly, within a restricted range. The noise-makers filter white noise with variable-speed sawtooth waves, and simple hi-pass filters. The sine tone oscillators trigger a random frequency each time their respective fader on the NanoKontrol is set to 0. The frequencies are lockable, if I stumble on something interesting, and each oscillator has a ring modulator, to add beatings to the overall texture. Here, I’m trying to continue from removing the screen – giving myself limited options, forcing me to listen, and hopefully make more interesting music. And it’s super-portable, which is a nice bonus. I’m planning on using the instrument both solo and in groups, and I’m recording an EP hopefully for release soon.